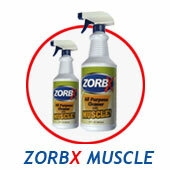 Simply spray ZORBX All Purpose Cleaner on any stained or troubled surface hard or soft. Then wipe off with paper towel or cloth. Add Muscle to Big Jobs, too! Dilute 1 part ZORBX All Purpose Cleaner in 10 parts water or cleaning solution - even carpet shampoo! Safe and smooth on your hands and all surfaces. Use it indoors and outdoors. We offer a 100% performance and satisfaction guarantee or your money back. ZORBX is biodegradable, non-microbicidal, and compatible with most fragrances. Made in the U.S.A.